Foundations: Spring Awakening | Words of Wisdom? Although we in north central Georgia haven’t experienced a winter as harsh as most other regions of the United States, we still celebrate its end as we welcome spring. This season of renewal is a time for the reminder or the realization of our connection to the Earth, and a time for connecting to the Earth’s power to nurture and support life. 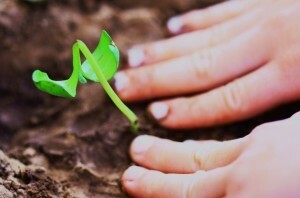 Spring is a time for performing the ritual of faith that is exemplified in the planting of a seed. In no undertaking is this power more evident than in that simple act. The Earth herself is a container for new growth and new beginnings. Just as the Earth’s potential to bring forth life has lain dormant throughout the winter, the seed carries within it, dormant, the potential for growth. About 12,000 years ago, when a human being first planted a seed, that person was taking a leap of faith and distinctly exhibiting an ardent hope for the future. Today, anyone who cares for the environment and works in furtherance of its protection is proudly embracing that same hope. We assume our role as stewards of the Earth bolstered by the faith of a long line of our ancestors back to those first “gardeners”; with respect and appreciation for what the Earth bestows on us, and knowledge of our responsibility to her. Cradled by her seasons, healed by her rhythms, comforted by her repeated refrains… Our impassioned dedication to the Earth and the spirituality of environmentalism feeds our souls. Acts of faith – leaps of faith – make perfect sense when you possess those “reserves of strength” of which Rachel Carson wrote. This entry was posted in Foundations and tagged Earth, environment, faith, seeds, spring, UU 5th Principle, UU 7th Principle. Bookmark the permalink.